This is one of a group of five unfinished sketches on vellum which remained in Samuel Cooper's studio at his death in 1672 and subsequently entered the Royal Collection, possibly during the reign of Charles II. The other sketches in the group show Catherine of Braganza (420644), Frances Theresa Stuart, Duchess of Richmond (420058), James Scott, Duke of Monmouth and Buccleuch (420645) and George Monck, Duke of Albemarle (420086). This sketch was described in 1683 by Francesco Terriesi, an agent acting for Cosimo III de' Medici, as: 'Duchess of Cleveland, face and head finished and beautiful, but nothing else' and was priced at £30, slightly lower than the £50 demanded for other sketches from the same group. Presumably the distinction was based on the extent to which the sketch had been finished, for in this case there is only the merest suggestion of a background wash and no details of the costume have been worked up at all. 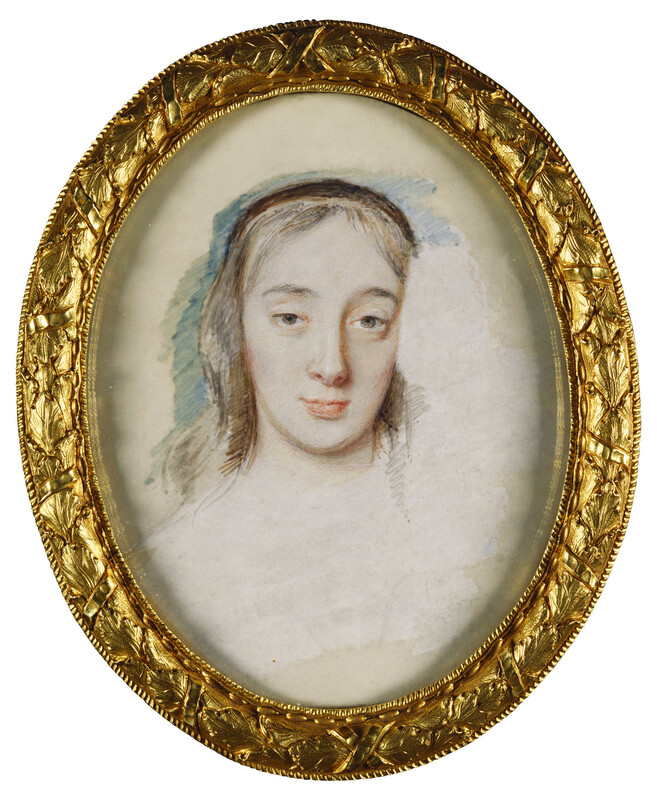 The pose of the Duchess of Cleveland in a finished miniature dated 1661 in the Royal Collection (420088) is sufficiently close to suggest that it may be related to this sketch. Cooper made a practice of making sketches of his sitters' heads on rectangular sheets of vellum laid on card with a prepared gesso back and other examples survive, including one of this sitter in the Victoria and Albert Museum (446-1892). It has been argued that as Cooper worked directly from his sitters in the studio, these sketches should be seen neither as preparatory works nor as patterns for later copies, but as partly-started miniatures on vellum intended to be worked up in full if a further commission was forthcoming. There was certainly considerable demand for portraits of the Duchess of Cleveland, whose influence and status was in the ascendant at the point at which she is shown here by Cooper. Barbara Villiers, Duchess of Cleveland, daughter of William Villiers, 2nd Viscount Grandison, first met Charles II during his exile in The Hague, and had become his mistress by May 1660. She bore the king six children and was created Duchess of Cleveland in 1670 before being supplanted in Charles II's affections by the Duchess of Portsmouth. She married, firstly, Roger Palmer, later Earl of Castlemaine, and secondly, Major General Robert Fielding.